Stress reduction is the most common reason people meditate. But there are other benefits, too. Plenty of people rely on it to stay centered, enhance awareness, lengthen attention span, reduce age-related memory loss, control anxiety, fight addictions and more. It’s clearly good for you. But just when you get excited about reaping the health rewards, problems set in… restless thoughts, sleepiness, body aches. This is especially the case for beginners. Whoever thought just sitting around practicing mindfulness could be so difficult! Step in Flowtime. The smart headband aims to make this job easier by providing insights into your mind and body. 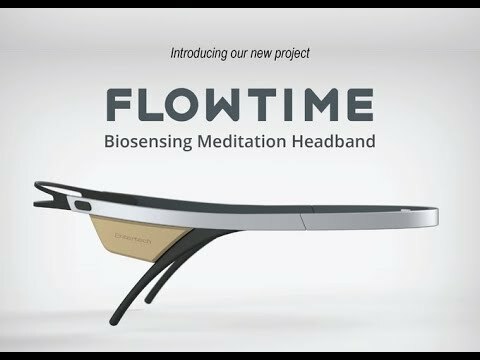 Launched a few days ago on Kickstarter, its capable of tracking and visualizing brainwaves and heart rate in real time while you are meditating. The headband does this via a two-channel EEG system and heart rate sensors. Simply place it on your head as you drift into your session. The gizmo observes and analyzes your α, β, θ, δ, γ waves, heart rate and heart-rate variability. All of this is visualized in the accompanying smartphone app giving you a holistic view of what is going on in your brain and body. This may especially be helpful to those who have trouble tuning out and overcoming mental roadblocks. To make the job even easier, the app has has guided and free meditation modes both for beginners and experienced users. Because of Flowtime’s partnership with Mobio Interactive, Inc., the lessons in the app are scientifically validated by the University of Toronto and St. Elizabeth Healthcare. Flowtime has an ultra-slim design and weights only 25 grams. It features an elastic rubber band in the back that keeps it firmly in position allowing you to use it for running meditation and yoga meditation. If you’re after an innovative way to understand what is going on in your head and body as you mediate, it’s worth having a look at this Kickstarter project. Usual warnings about crowdfunding apply.